The Grado Black2 and Gree21 phono cartridges are excellent low cost phono cartridges for a new vinyl junkie! The Grado Blue2 and Red2 offer great sound and durability for the dough. Great for getting started with an older turntable or upgrading your new turntable with a better cartridge! The Grado Silver2 and Gold2 represent the very best of the Grado Prestige Series phono cartridges and perform far beyond their cost. 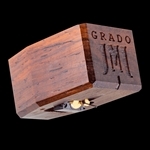 The Grado Platinum1 comes in low and high gain models and is one fine wood bodied cartridge. The Grado Sonata1 is a real winner and the finest phono cartridge in its price category. We highly recommend it! The Grado Reference1 delivers some of the most beautiful sound - warm detailed and natural - the way music should sound! The Grado Statement1 is the flagship phono cartridge from Grado Labs. Outstanding MI cartrdige and highly recommended. The Grado Aeon is a superb MM phono cartridge that will delight your ears! Top of the line phono cartridge from Grado Labs that brings live music into your home. Simple beautiful sound!